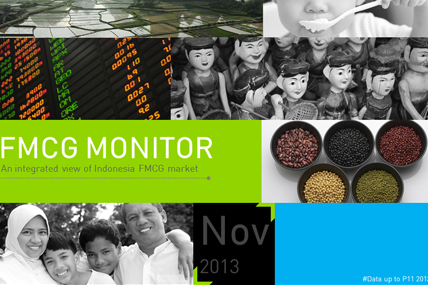 Indonesia's gross domestic product (GDP) expanded 5.62 percent in the third quarter of 2013 from year ago. The result implies the continuation of Indonesia's slowing economic growth. This is the weakest since the 2009 global recession as a declining rupiah restrained investment in Southeast Asia’s largest economy. Foods and beverages segment are the lowest in term of growth, whilst Personal Care and Dairy continue to lead the market in both Urban and Rural with two digits growth year on year. White coffee shows excellent growth in Urban, especially in expanding into more consumers, with more than 3.2 million households recruited in the latest 3 months versus year ago. This buyer incremental successfully lifted the total value of white coffee by more than 46%. Minimarket grows by two-digits this period and also the share slightly increase in Urban versus the same period last year. The share incremental of minimarket is followed by slightly decrease in share of traditional trade.